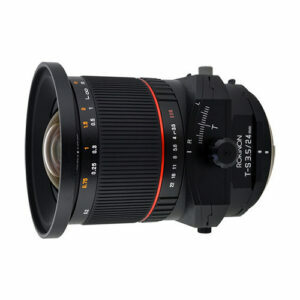 Lens Description: The Tilt-Shift 24mm f/3.5 ED AS UMC Lens for Nikon from Rokinon is a wide-angle, full-frame lens fitted with the perspective control and tilt-shift functions. A tilt-shift lens allows the user to control perspective and correct convergence of lines within your frame, useful especially in architecture, landscape and product photography. The optical tilt mechanisms enable precise control of depth of field along with perspective control. It is compatible with both digital and film formats with an angle of view of 83.5º and on an APS-C size sensor has an angle of view of 59.9º and focal length equivalent of 36mm.